This will add class and distinction to any graduation party invitations, especially if used with sealing wax in the school’s colors! Order now, as Shapeways can take up to 12 business days to make and ship your order. Also, Father’s Day is coming up! What better for the man who has everything than a custom wax seal? For a limited time we have a special offer: a steel seal with two letter monogram and 4 sticks of sealing wax for only $99 (a $140 value). Order by Sunday (5/26/2013) to guarantee delivery by Father’s Day! * For those who wait too long, seals and wax ordered through our Etsy Store usually arrive in about 5 business days (shipping within the USA). *Special offer only available via email or our Contact page. Tax and shipping not included. 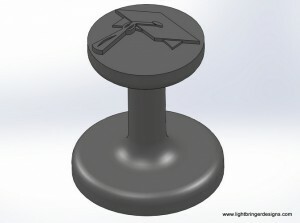 This entry was posted in Events, New Products by lightbringer. Bookmark the permalink.